A house overlooking a pond. Claudia King and Lindsey Tweed have hired Dan Kolbert to implement a deep-energy retrofit of their home in Falmouth, Maine. 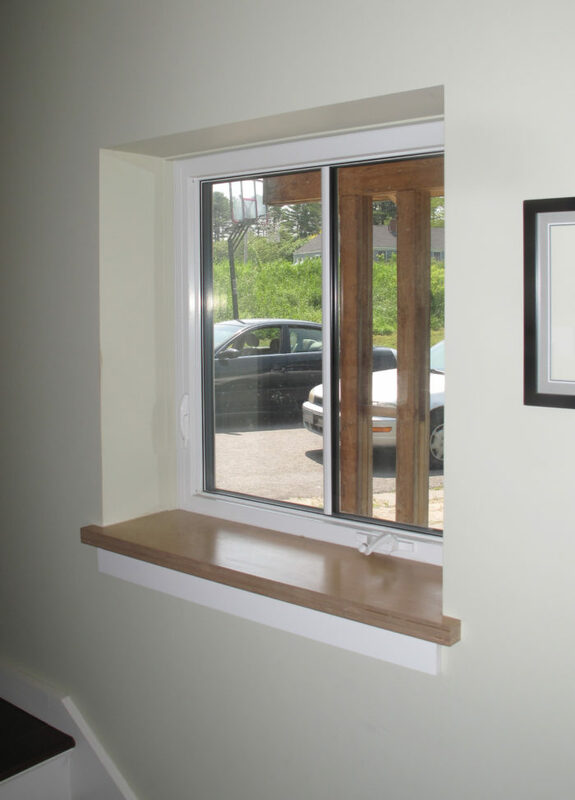 New triple-glazed windows and exterior rigid foam will greatly improve the home's energy performance. 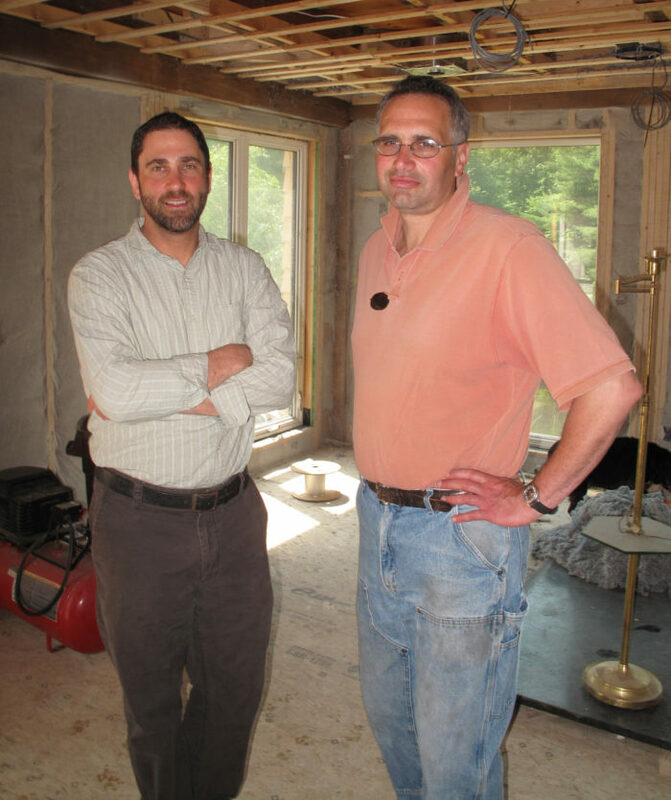 Image Credit: Martin Holladay Architect Phil Kaplan and builder Dan Kolbert. Image Credit: Martin Holladay Dan Kolbert's crew is finishing up the exterior work on the deep-energy retrofit job in Falmouth. Image Credit: Martin Holladay A multi-layer sandwich. The exterior walls of the King-Tweed house are insulated with two layers of 2-in.-thick polyisocyanurate. 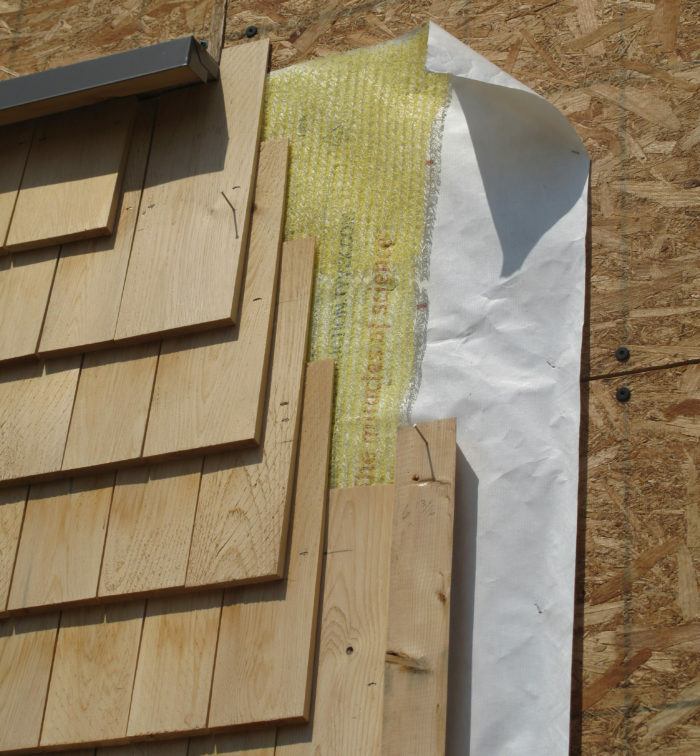 To provide a nailing surface for the siding, the rigid foam is covered with a layer of OSB, followed by Tyvek housewrap, a layer of Benjamin Obdyke Home Slicker to provide a rainscreen air gap, and white cedar shingle siding. Image Credit: Martin Holladay Nice trim detail: The Serious Windows on the King-Tweed job are installed as in-betweenies. Instead of trimming the exterior jamb extensions with 3/4-in. boards or cellular PVC, Dan Kolbert's crew finished the exterior jambs with white cedar shingles with woven corners. Image Credit: Martin Holladay New 2x6 studs were installed between the existing timber posts, and dense-packed cellulose was installed behind air-permeable netting. 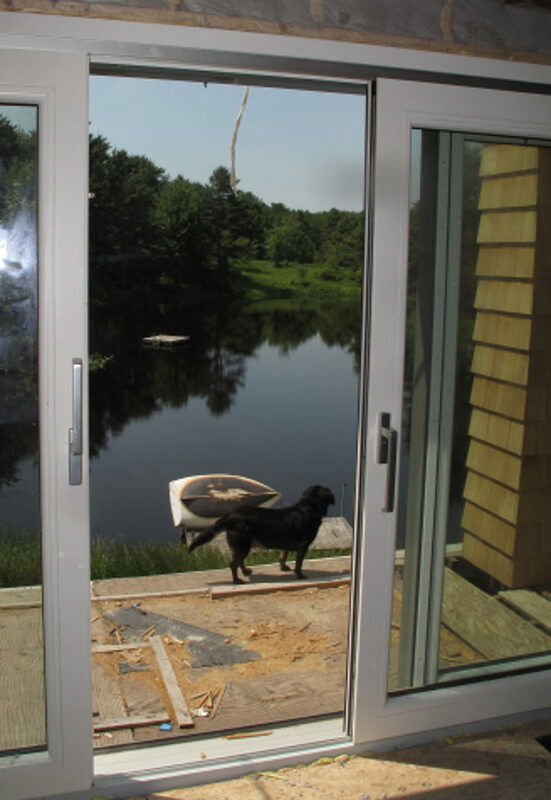 Image Credit: Martin Holladay A view of the pond through the Drewexim triple-glazed sliding doors. 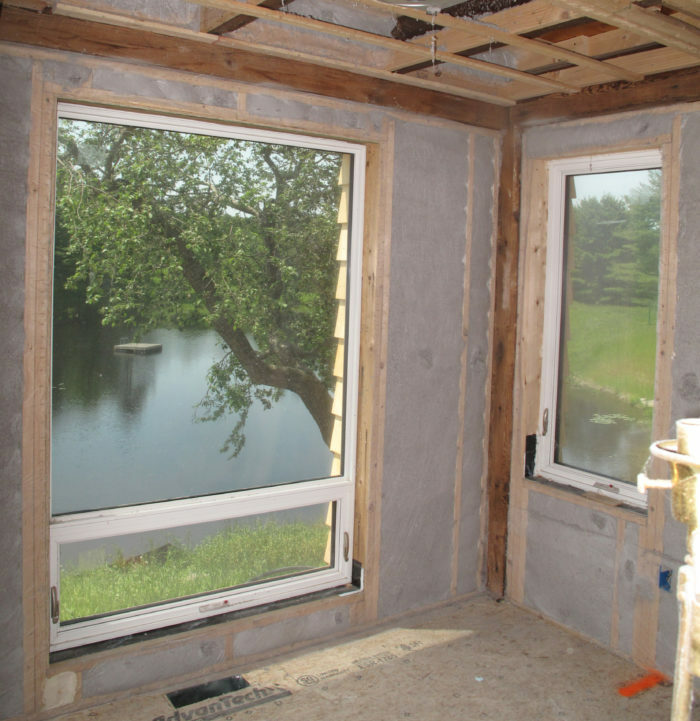 Image Credit: Martin Holladay More cellulose-insulated walls, with the pond beyond. Image Credit: Martin Holladay Stewart MacLehose hired Dan Kolbert to build a new house in Falmouth, Maine. The house was designed by Kaplan Thompson Architects. Image Credit: Martin Holladay These evacuated-tube solar collectors supply a portion of the MacLehose home's domestic hot water and space heating needs. Image Credit: Martin Holladay Dan installed the triple-glazed Thermotech windows in the MacLehose home as "outies," without interior trim. The drywall returns were a quick and inexpensive interior detail. To heat the domestic hot water and hydronic space heating water during cloudy weather, MacLehose uses an electric-resistance instantaneous water heater. 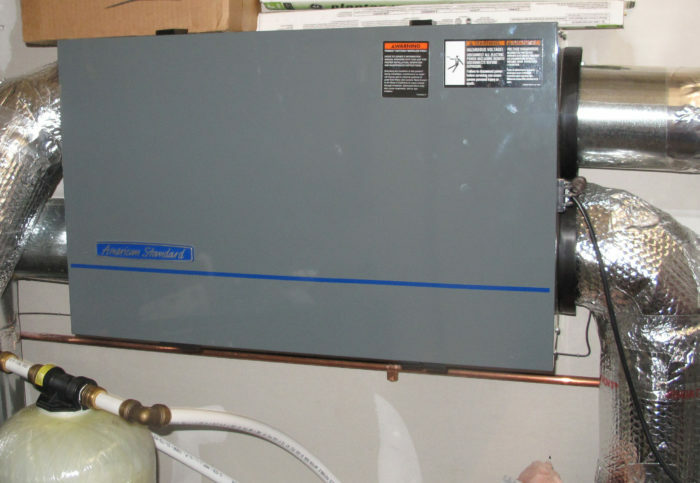 Image Credit: Martin Holladay Mechanical ventilation in the MacLehose home is provided by an American Standard ERV. 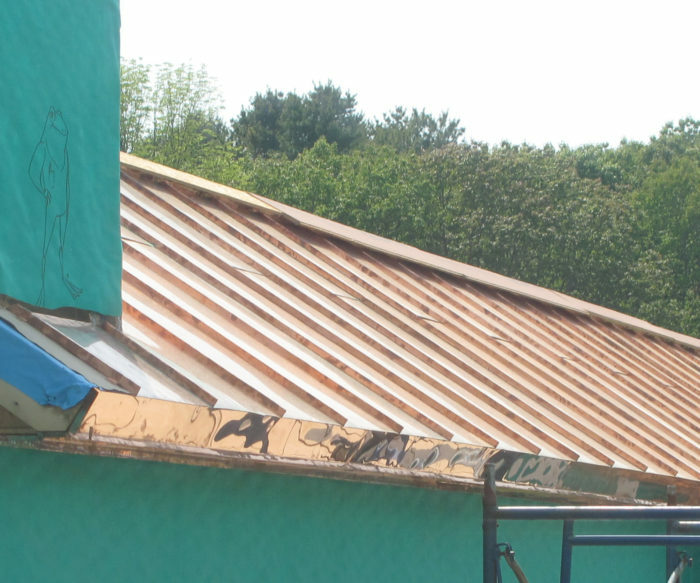 All of the roofing at the co-housing project is standing-seam copper. Image Credit: Martin Holladay The common room of the co-housing project includes a curved bank of fixed windows. Image Credit: Martin Holladay A view of the exterior of the 3,300-square-foot guest house at the Southern Maine Co-housing Project. Image Credit: Martin Holladay Workers installed horizontal 2x4 ledgers at the base of the exterior walls to support layers of rigid foam insulation installed over the Zip sheathing. Image Credit: Martin Holladay It takes a lot of polyiso to cover all of the exterior walls of a large building with two layers of foam. Image Credit: Martin Holladay At the co-housing project, the framed walls were covered on the exterior with "site-built SIPs" consisting of two layers of 2-in.-thick polyisocyanurate insulation sandwiched between two layers of OSB. On the exterior side of the sandwich is a layer of housewrap, followed by Benjamin Obdyke Home Slicker to create a rainscreen air gap and cedar shingle siding. Image Credit: Martin Holladay New copper is very shiny. Image Credit: Martin Holladay Even the soffits are covered with 16-oz. copper flashing. Note the custom-made copper air intake grille in the soffit; it is for the heat-recovery ventilation system. 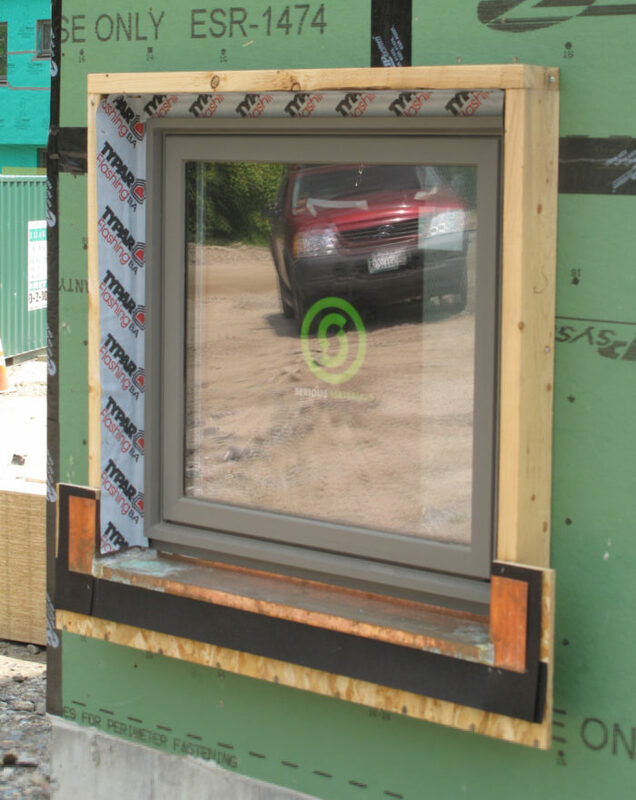 Image Credit: Martin Holladay When windows are installed as “innies” or “in-betweenies,” what's the best material to use for the exterior sill? 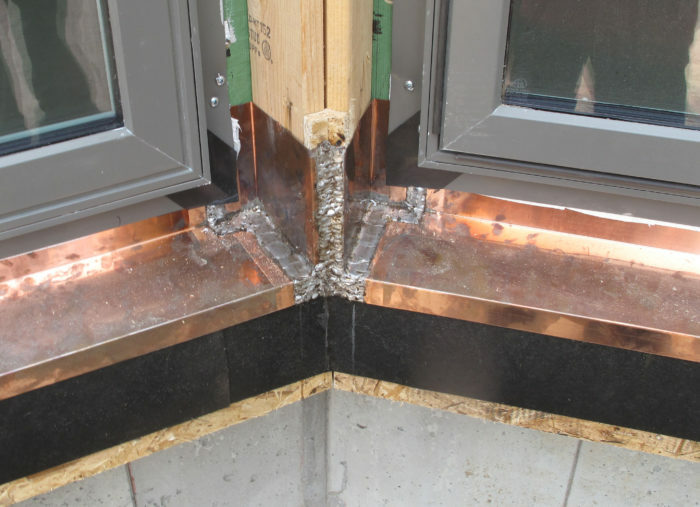 Builders are experimenting with a variety of materials, but the sills at the Southern Maine Co-housing Project — soldered copper sills — win the prize for durability. The unfinished solder joints on these sills will later be cleaned up. 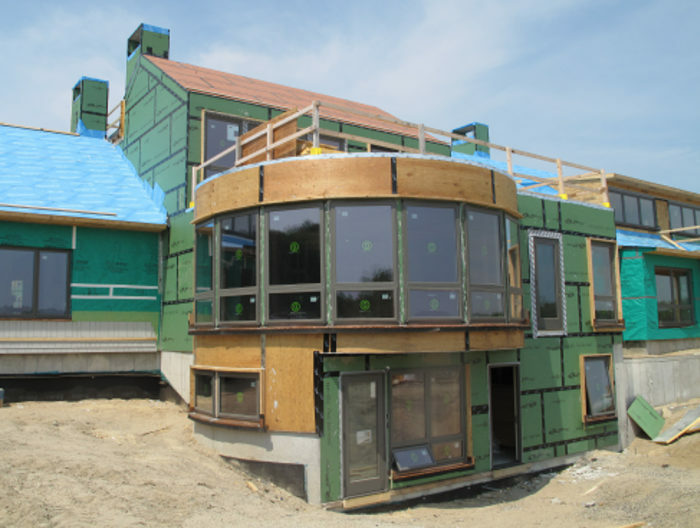 Image Credit: Martin Holladay These Serious Energy 925 windows are carefully flashed and detailed to prevent air infiltration and water entry. 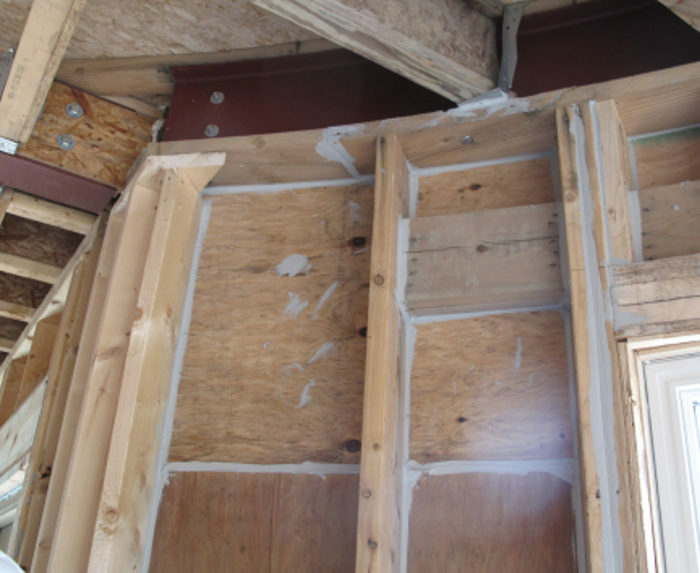 Image Credit: Martin Holladay At the co-housing project, potential air leakage paths at doubled framing members and sheathing joints were all caulked from the interior. 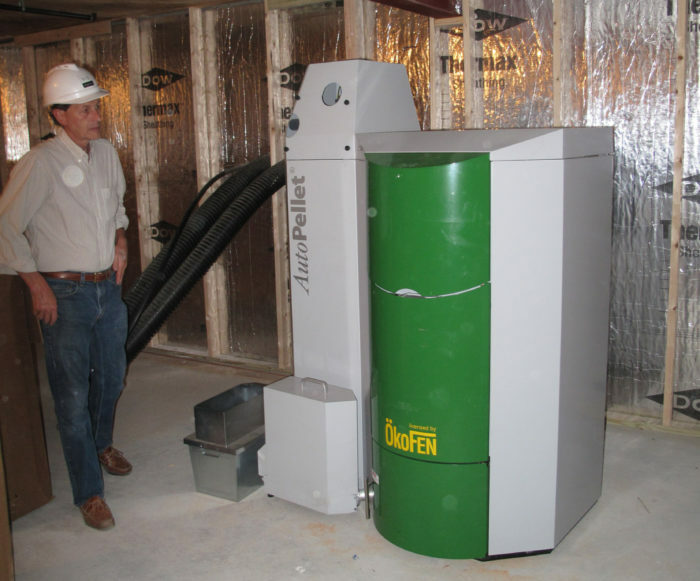 Image Credit: Martin Holladay Project manager Don Hawkes shows off the Austrian pellet boiler installed in the basement of the Southern Maine Co-housing Project. Hot water from the boiler will be delivered to both buildings; buried insulated tubing has been installed between the boiler and the guest house. Image Credit: Martin Holladay Heat from the project's wood-pellet boiler is distributed by staple-up PEX tubing. On my second day in Maine, I toured seven energy-efficient buildings in various stages of construction. In last week’s blog, I reported on my visit to Richard Renner’s office and Jesse Thompson’s house. This blog picks up the story with a report on my visit to three sites: an ongoing deep-energy retrofit project, a new home in Falmouth, and an unusual co-housing project. If you’re the type of reader who prefers pictures to words, you’re in luck: this week’s blog is loaded with photos. After I returned home from my Maine visit, I pondered the similarities and differences between building practices in New England and building practices in the Pacific Northwest, where I visited several job sites in March 2011. On both coasts, energy-efficient builders have embraced triple-glazed windows. But insulation practices are starkly different: in Washington state, all of the energy-conscious builders are using blown-in fiberglass insulation, while Maine builders are all choosing cellulose. I have no explanation whatsoever for this startling difference in insulation practices. Claudia King and Lindsey Tweed own an old post-and-beam house on a picturesque rural site in Falmouth, Maine. With diverse views in all directions — a large pasture, patches of woods, and a nearby pond — it’s easy to understand why someone would fall in love with the site and the existing house. A team of professionals — including architect Phil Kaplan, energy consultant Marc Rosenbaum, and builder Dan Kolbert — have been collaborating on a deep-energy retrofit of the home. When I visited the site on the morning of June 8, 2011, workers were moving soil in preparation for a new driveway, building a stone retaining wall, and installing siding and exterior trim. To improve the home’s energy performance, the siding and windows were removed and the walls were gutted. Because the original studs were scabbed together in a haphazard way, and because it was necessary to reframe the window openings, the old studs were removed and new 2×6 studs were installed between the posts of the existing timber frame. The stud bays were later filled with dense-packed cellulose insulation. The walls were sheathed with new Zip System OSB panels. 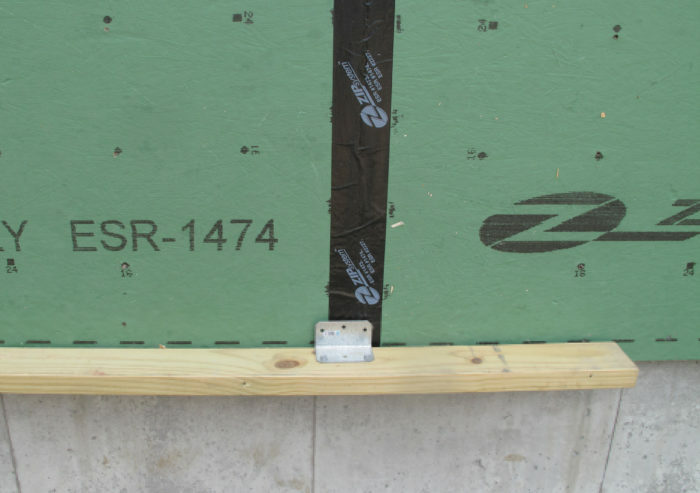 This sheathing was then covered by a layer of 2-inch-thick polyisocyanurate, followed by a layer of nailbase consisting of 2 inches of polyiso with a facing of OSB. (This second layer of OSB facilitated the installation of the siding.) After the nailbase was up, the crew installed Tyvek, Benjamin Obdyke Home Slicker (to create a drainage layer), and new cedar shingles. The completed wall assembly is rated at R-44. The basement walls are insulated on the exterior with two layers of Roxul mineral wool with a total thickness of about 4 3/4 in. The house has new Serious Energy 925 windows with Heat Mirror glazing (two layers of glass and two suspended plastic films). 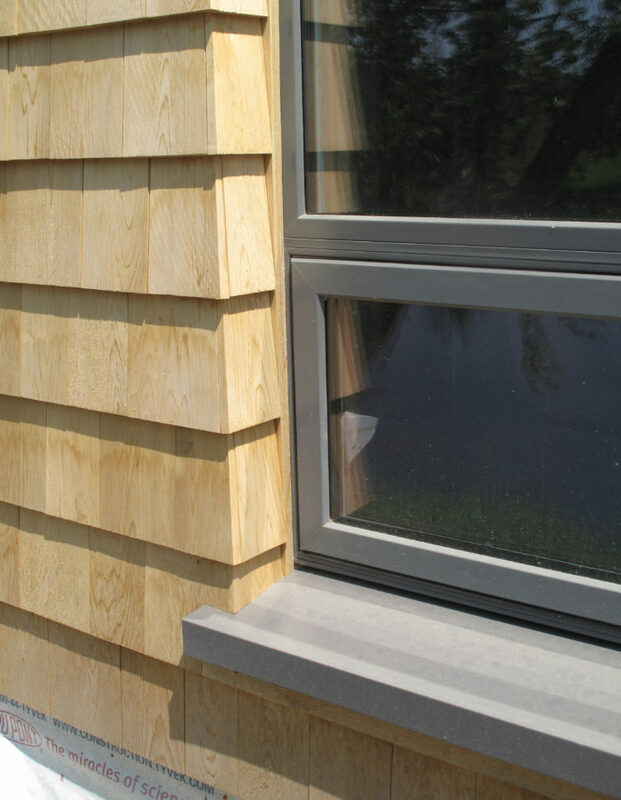 The windows are installed as “in-betweenies” (rather than innies or outies), with a nice trim detail on the exterior: the exterior jamb extensions are finished with cedar shingles with woven corners. Space heat will be provided by a combination of ductless and ducted minisplit air-source heat pumps. I already mentioned this retrofit job in a previous blog, when I reported on my conversations with Phil Kaplan and Claudia King on their approach to nailing down the insulation specifications for this house. At first, Claudia and Lindsey hoped the house would achieve the Passivhaus standard. However, after Marc Rosenbaum used PHPP software to determine what it would take to get there, they abandoned the idea. (Even R-44 walls weren’t good enough; the PHPP software pointed towards the need for R-56 walls.) 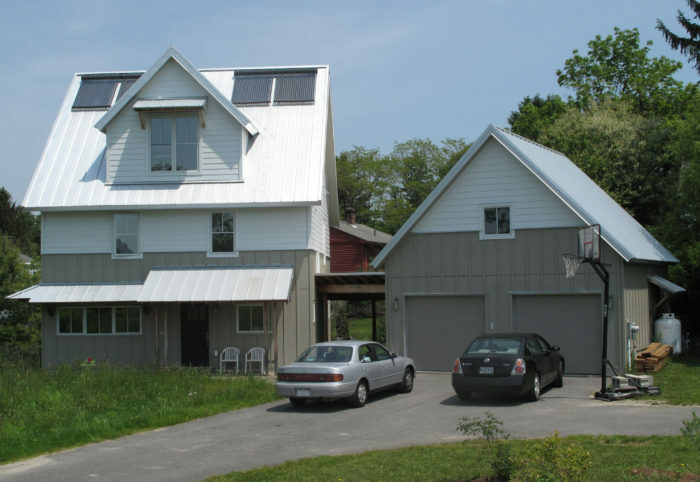 They decided that they couldn’t justify spending thousands of extra dollars on Passivhaus levels of insulation to save just a few more BTUs per year. 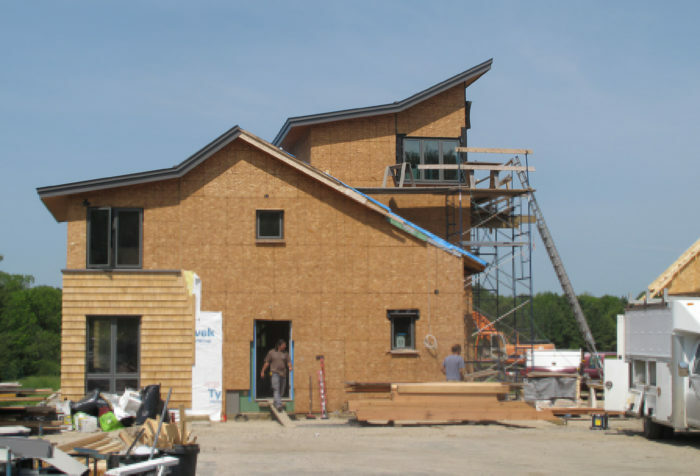 Although their superinsulated home won’t achieve the Passivhaus standard, it will still have a thermal envelope that is far superior to typical residential construction. 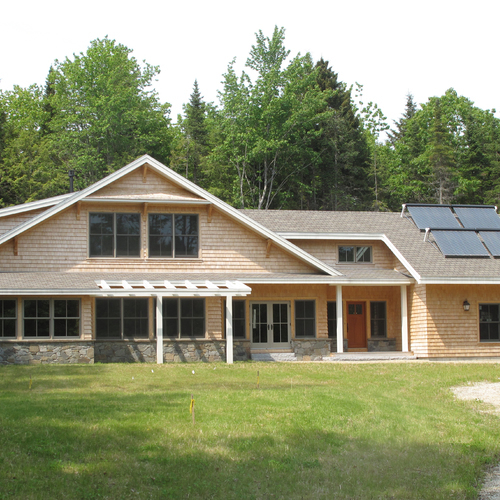 Like many other deep-energy retrofit projects, including the retrofit of Jane Bindley’s ranch house in New Hampshire, the extensive work at Claudia and Lindsey’s house will cost more than it would have cost to demolish the existing house and build a brand-new superinsulated home. The high cost of these projects certainly complicates any future policy decisions concerning our national response to the climate-change crisis. For more details on the project (as well as on the other homes mentioned in this blog), be sure to click on the photos and read the captions. I next visited a compact, energy-efficient house in Falmouth owned by Stewart MacLehose. The new-construction project was designed by Kaplan Thompson Architects and built by Dan Kolbert. 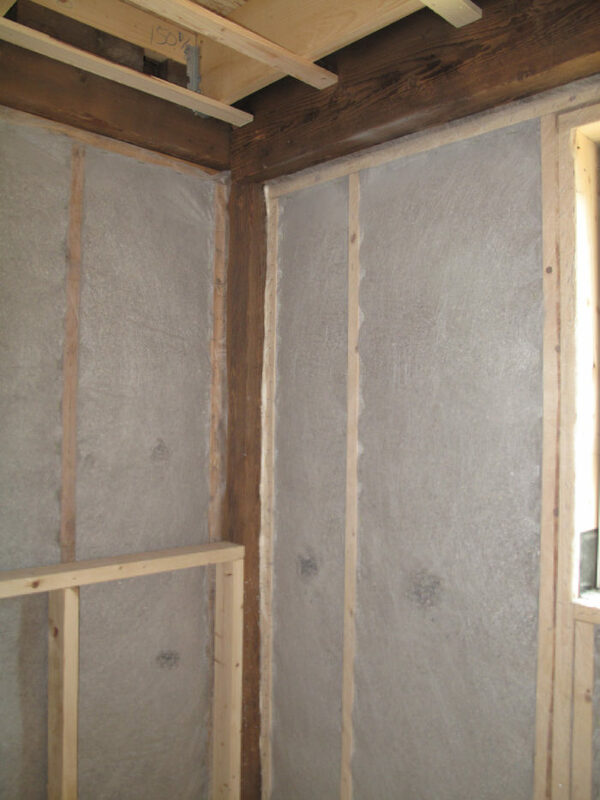 Wall construction: 11.25-in.-thick double stud walls filled with dense-packed cellulose. Roof assembly: an insulated sloped ceiling with 14-in.-deep unvented rafter bays filled with dense-packed cellulose. Windows: Thermotech fiberglass windows with triple glazing. Finish flooring: tinted concrete slab on grade. Space heat: Solar thermal system (roof-mounted evacuated tube collectors) with electric-resistance backup. 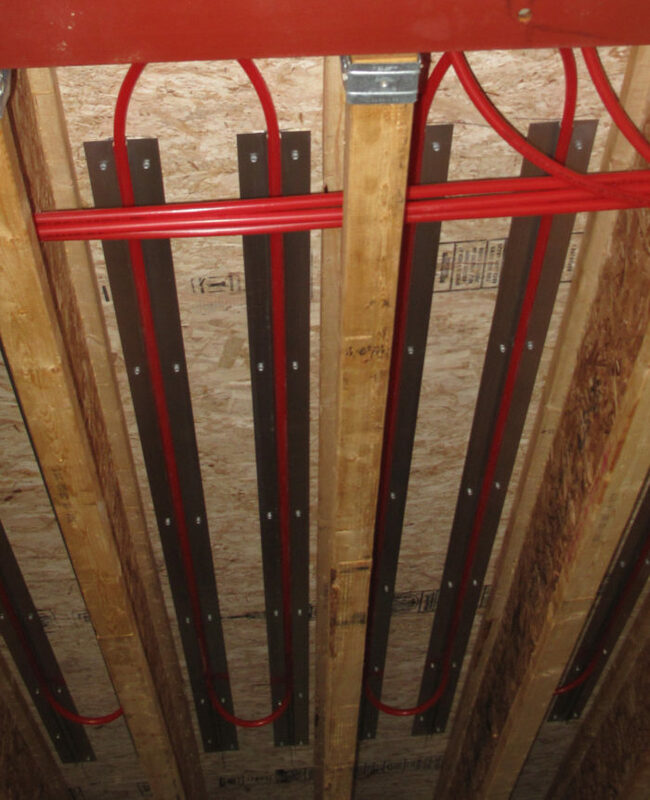 Heat distribution: In-floor hydronic tubing on first floor only. 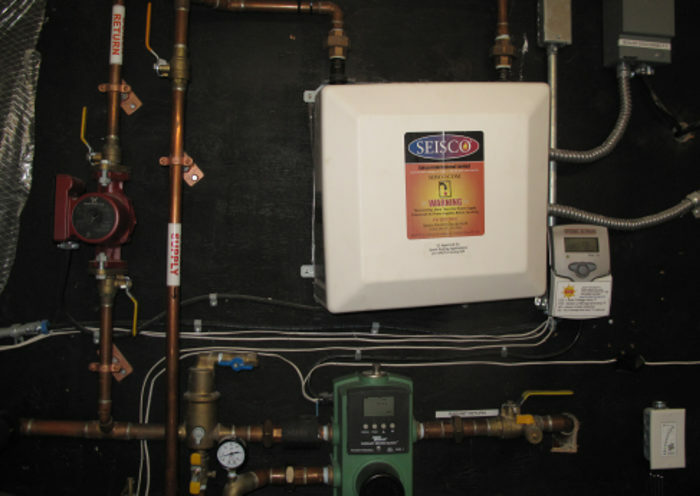 Domestic hot water: Solar-thermal system with electric-resistance on-demand water heater as backup. Mechanical ventilation: American Standard ERV. Blower-door test results: 0.77 ach50. Dan Kolbert likes the fact that the house is compact and simple. “Engineering is the enemy,” says Dan. This attractive house is a true energy miser. To learn more about the home’s construction details, be sure to read the excellent article on the house that Dan Kolbert wrote for the Journal of Light Construction. The next job site I visited was highly unusual. Two buildings are under construction on the 17-acre site: a very large (11,000-square-foot) building, the size of a small school, and a nearby 3,300-square-foot building the size of a large single-family home. The big building is a co-housing development designed to accommodate three families; it includes a common meeting area. The smaller detached building is a five-bedroom guest house. The project includes a garage with five vehicle bays and an apartment for a future care-giver. The buildings at the Southern Maine Co-housing Project were designed by Richard Renner Architects, with help from energy consultant Marc Rosenbaum. The project is being built by Wright-Ryan Construction under the direction of project manager Don Hawkes. 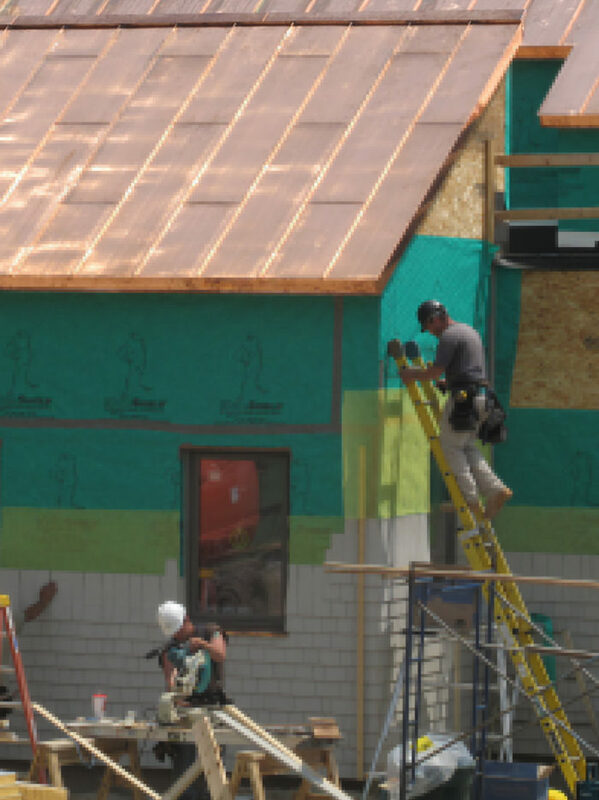 I used to work as a roofer, so the first thing I noticed at the site was the lavish use of copper. 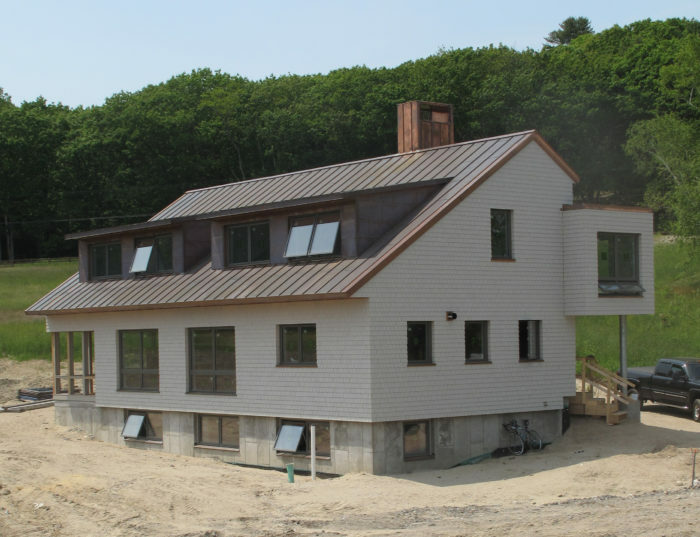 All of the buildings are roofed with standing-seam 16-ounce copper. 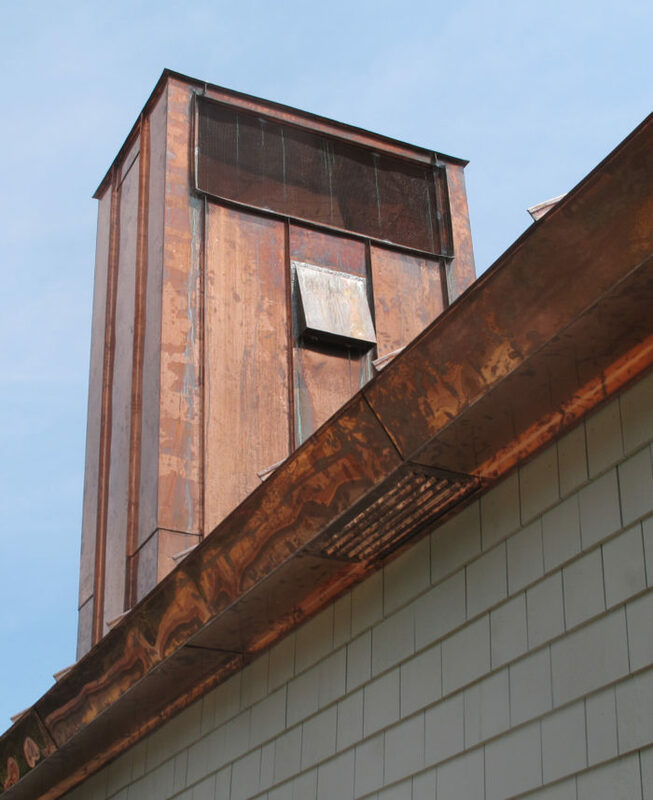 Copper also covers the dormer cheeks, fascia, soffits, and window sills. For a copper junkie like me, it’s a stunning project. Copper was specified for the roofing and flashing because the clients requested exterior details that require minimal maintenance. They also told their architect that low energy consumption is a high priority. The project includes a 25-kW photovoltaic array — large enough to generate as much electricity as the buildings consume. Basement slab insulation: 4 in. of continuous horizontal XPS under the slab. Basement wall insulation: 3 layers of 2-in.-thick polyisocyanurate on the interior of the walls. Above-grade wall construction: 2×6 studs filled with dense-packed cellulose, with two layers of 2-in.-thick polyisocyanurate foam on the exterior of the walls sandwiched between two layers of OSB (“site-built SIPs”). Space heating: a central wood-pellet boiler (an Ã–kofen boiler from Austria); pellets will be delivered by truck and blown into a basement bin. 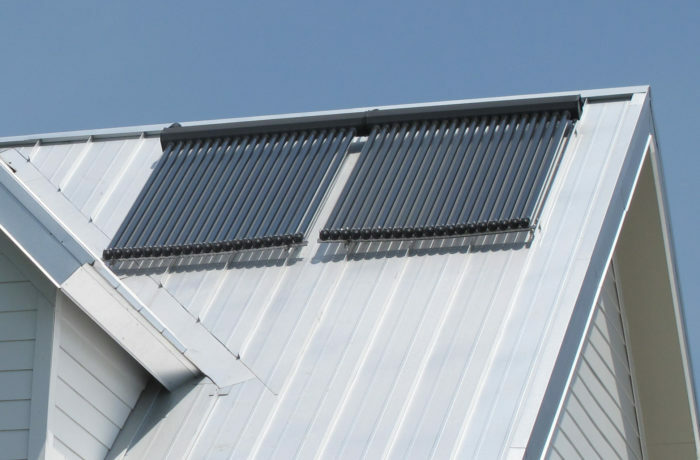 Domestic hot water: a solar thermal system. In next week’s blog, I’ll report on a visit to a new-construction project in Freeport designed by Chris Briley and built by Dan Kolbert, as well as a tiny new energy-efficient home being built by GO Logic in Bath. Thanks for your comments. Thermotech Fiberglass makes great windows, but reports of slow customer service from Stephen Thwaites, the technical director of Thermotech Fiberglass, are legion. After I requested a price quote for some windows for my own house, I had to thwait for Thermotech for almost a year before I got a response. Another customer who got tired of thwaiting for Thermotech was David Pill, who posted a report of his unhappy experiences on this GBA page. Martin - I'm glad you got so much good material from your trip - we enjoyed having you here. We are really happy with the way the Maclehose house has performed since completion. With a modest PV array, it could get to net zero. I do feel compelled to point out, though, that while we think the ThermoTech windows have clearly added to the house's performance, we have had ongoing warranty issues over some relatively minor problems that have soured our relationship with the company. As I've told them directly, they desperately need a service and warranty division or they will just add to their list of former fans. By the look of the windows on the first project, the visible transmittance is unacceptably low. Particularly the sliding glass doors...there is a stark difference between the open door and the glass areas. in the photo at least. Hopefully the DOE promise of super windows, with high VT, variable SHGC and super low U-values will someday come to fruition, so we're no longer stuck with these kind of sour compromises. Thanks for all the photos Martin, love em'. On another note, LOVE those woven shingle window details. That is really a lovely touch. New England has a long history with cellulose weatherization in renovation, and that has led to lots of contractors available with skill and experience at the material and a history of application. It's a material with a long history here. In contrast, your visit to the PNW was a Passivhaus gathering, in an area without this history with cellulose or low-energy construction. 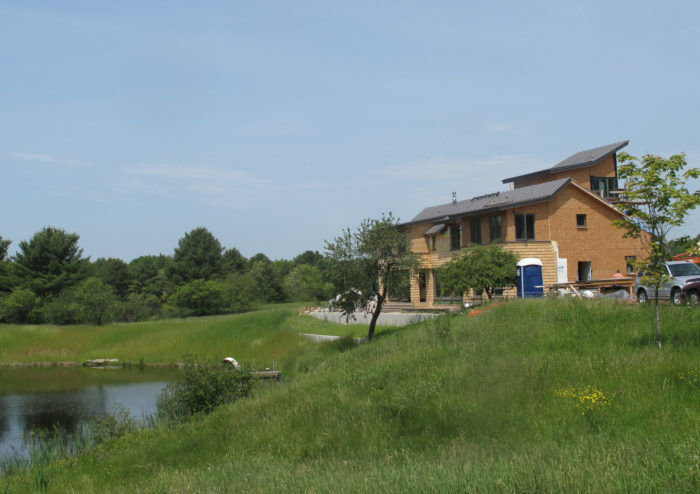 Katrin Klingenberg's first Passivhaus were fiberglass dense-packed, and PHPP provides an R-Value of 3.78 to fiberglass, and 3.47 to cellulose. Guess which material the PNW Passivhaus group tends to favor? I wasn't aware that PHPP favored fiberglass. I wonder if the R-values in the PHPP are based on the best available data? The measured R-value of today's cellulose — so-called fiberized cellulose — differs from the measured R-value of the old hammer-milled cellulose of the 1980s. I don't have the numbers in front of me (I bet Jesse has them) but the VT was actually higher on the Drewexim doors (which are triple glazed) than on the Serious windows (which rely on the interior film for the 3rd layer). The loss of light was an issue we discussed as a team, and decided the benefits outweighed the downsides. And the corners do look great - Richard Lo of Kaplan Thompson gets credit for that detail, among many others. The VT for the Serious 925's with 9H glass are .48. As a rule we, like to go no lower than .50, so we were right on the edge here, but still felt it was ok. On the west corner of the tower, we chose the 9L glass with a VT of .36 but a SHGC of .20 instead of the 9H's SHGC of .37 in order to combat overheating on August afternoons. A huge nod here goes to Richard Lo of our office (as Dan has mentioned), who is Project Manager and responsible for much of the design. A couple of comments - the generic R-values for both dense-pack cellulose and dense-pack fiberglass in the PHPP are low, compared to all manufacturer's specs that I've seen. That said - it is always up to the consultant/architect/builder to get accurate data for the actual products being used. I typically see dense-pack cellulose listed at R-3.7/inch or R-3.8/inch. I typically see dense-pack fiberglass (such as http://www.specjm.com/files/pdf/bid0062.pdf) listed at about R-4.2/inch. Not everyone out here in the northwest prefers fiberglass, in fact there is a strong contingent that abhors it. Look for a number of non-fiberglass passivhaeuser to start up in the next year or so with cellulose. It's great to see that your on the road again! To your publishers: This is the type of reporting that is really invaluable (in my opinion). Here we get to see what others are up to, spotlight regional differences, see a quantity of pictures and details that is often not possible with print. You wrote: "in Washington state, all of the energy-conscious builders are using blown-in fiberglass insulation, while Maine builders are all choosing cellulose. I have no explanation whatsoever for this startling difference in insulation practices". Martin: That is of course limited to the projects that you visited. 4 of the 5 were dense pack fibre glass. 1 was exterior foam. All of them Passive House projects. It is correct that the reasons that fibre glass was chosen over cellulose was the edge in value that it gave over cellulose. I had recently just had that conversation with Tessa Smith, designer of your lead project in "More Passivhaus Projects in Washington State" https://www.greenbuildingadvisor.com/blogs/dept/musings/more-passivhaus-site-visits-washington-state. Note that the values are not fixed in the PHPP. The designer does get to choose their material and enter the specific values of the "brand specific product" to be used. I've attached the "R Value" page from my PHPP example project. Although it does not site a fibre glass or cellulose example, you can see from the entry page how you would build a dense pack wall. Tessa did go on to say that she would have preferred to use cellulose, but that the extra value did make a substantial reduction in the overall load. To prevent some from inferring that the PHPP is too much of a "demanding mistress", making one make efficiency choices towards fibre glass over cellulose... Note that this project had zero sub slab foam, leaving "our sub slab foam debate" where it belongs: Below grade. Happy 4th. I just expressed by opinion of blown-in fiberglass in response to Carl's blog, but will share it here as well. I am a Pacific Northwest builder located in the San Juan Islands. Blown-in fiberglass is definitely the norm in higher-end homes around here. Cellulose is quite uncommon, actually. Being both the designer and builder of my projects, what insulation get used is often up to me to recommend. I recently called all of the insulation contractors in my area and inquired about fiberglass vs cellulose from their perspective. None of them seemed to be inclined to recommend cellulose over fiberglass blown-in. They seemed far less familiar with the cellulose and thought it was more susceptible to water problems. When scanning the GBA website the two products seemed similar. Since dense packed fiberglass seemed to get slightly higher R-value ratings in general and because the subcontractors seemed to recommend it more highly, I went with the fiberglass. I was optimistic that it was the best choice. After using it my opinion changed dramatically. For many weeks, everyone who worked in the building after it was installed had a cough reaction to the air. Not till everything was covered up and every space was vacuumed multiple times did it finally subside. It was very discouraging to be in a space that I had poured my heart and soul into designing and constructing and now be wondering if we were getting a dangerous exposure of some kind due to a material that I had selected. When I hear the debate about whether or not fiberglass is or isn't a carcinogen I wince a little extra now. I used to think there was a consensus to the contrary, but now I am less sure. In truth, I can only hope it is not. The blown-in glass that we used definitely gave us plenty of exposure. I for one will advocate for cellulose all of the way, now, and will drag the insulation subcontractors in my area along for the ride if I have to. I will be taking the Passive House training in Portland this summer and will surely have to face the ramifications of my new opinion in terms of PHPP, but honestly I can not imagine selecting the fiberglass again, even if it is "only the drywall hangers" who have to be exposed to it next time (often the case). I just do not feel good about it anymore. I already responded to your comment on Carl Seville's blog, but I'll post my response again here for the benefit of GBA readers. 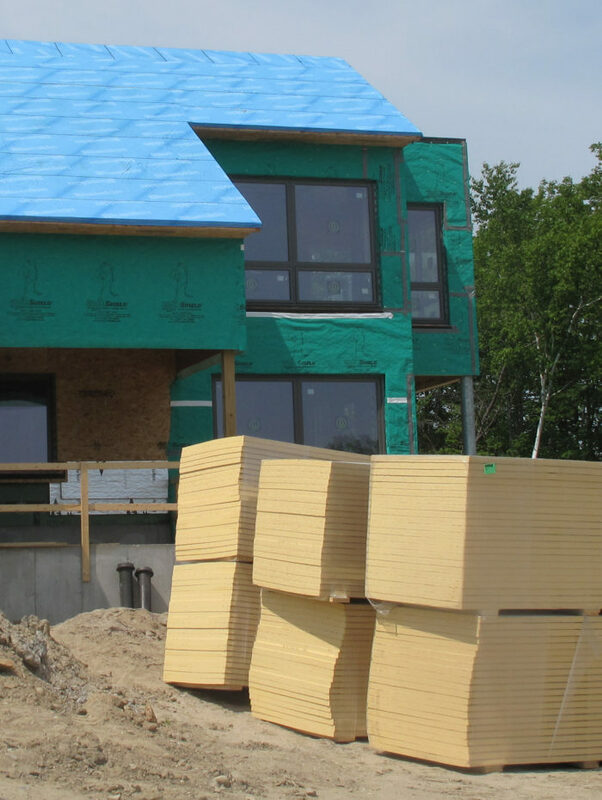 I've always preferred cellulose to fiberglass, for a variety of reasons, and I was surprised to discover that builders and insulation contractors in Washington state are relatively unfamiliar with the product. I'm sorry to hear that you and other workers suffered from coughing spells after you insulated with fiberglass. It's probable that your lungs won't have long-term damage, although any future research that leads to a different conclusion would just provide one more reason why cellulose is a better insulation. It sounds like this was your first insulating job. I worked with fiberglass batts for years, like most residential builders, and I have experienced the itching and occasional coughs that come with working with fiberglass. However, residential construction work is often unpleasant, and it's important to distinguish between discomfort and a serious health threat. Anyway, as I said, construction work can be irritating. But we must distinguish between irritation and serious health threats -- for example, asbestosis or lead poisoning. I have been in the construction industry since I was 19 or so. Working as a mason for nearly a decade was certainly hard and dusty work. You are right that the work is sometimes unpleasant. But that does not mean it should been any more unsafe than it has to be. Though I have worked around fiberglass many times and installed it myself a number. I had never had the experience of both specking the blown-in myself and then coming right in behind the insulators to begin putting up wood ceilings in every singly room which lasted for several weeks - mostly before the drywall was yet hung. I guess my real point here is that every time I hear the debate about glass fibers as a carcinogen I shudder a bit, especially as I get a bit older and feel a little less immortal. I have read the literature that explains why it is and why it is not a carcinogen and have come to the conclusion that the debate will not get settled anytime soon. My recent dose - which was perhaps simply the strongest exposure I have had, has convinced me that it is not worth the risk and that cellulose has to be the way. To bring this back to your regional building tour, I have been encouraged to learn that cellulose is the norm in New England, at least among a certain type of builders. The ability to get a view across the country to another region that is similar to the pacific nw is really valuable. It encourages me to challenge my regional insulation contractors to get comfortable with cellulose. Albert Rooks journeys to Europe and back these past few years in search of new relevant materials and building techniques have been similarly useful. I would love to see you, Martin, sent to Europe annually to observe a few different projects there, especially in northern Europe (Taunton - please note). More common use of things like autoclave blocks would be just one example of what you might see and be able to share back with the rest of us. I'm sorry if my response assumed your were inexperienced; thanks for setting me straight. I certainly agree that working with cellulose is more pleasant than working with fiberglass. And if my bosses at Taunton ever want to send me to job sites in Europe, I'd be delighted -- and I'd certainly report back what I found. Fiberglass or cellulose. it's your call. There is no material that I like better than one that grows out of the ground, then requires minimal energy to convert it to its primary use, and then is recycled for a secondary use as an insulation material. Once that secondary use is at an end, it can go into the ground, decay, and the cycle starts again. Good stuff! There is no need to back down from cellulose in the PHPP. Even though we apparently have trouble spelling sellulose in Washington State, you can model it in your project. All it takes is for you to be happy with your heating & cooling loads and the insulation values and assembly thicknesses, and your there. Most thermal resistance test reports based on ASTM C518 on a dense packed cellulose installation at 3.0 PCF I have reviewed was close to R-3.9 per inch in a steady state thermal transmission rate. Our data from the wall sensors at the SunRise home is showing us about an R-value of 3.8 to 3.9 per inch in real world application from the heat flux, we installed at 3.0 to 3.5 PCF. My recommendation is to use R-3.8 in PHPP or other modeling. Cellulose thermal resistance stays about the same until you get over about 4.5 PCF then it actually starts to lose R value. So there is a fairly wide margin of density which one should keep in mind - blowing at a higher PSF is ok - trouble starts with not enough density, as you will get settlement in anything less than 3.5 PSF. And in a wall assembly we do not want any settlement. Installed correctly and at the right density it cannot settle - simple physics. All of this looks of course only at steady state R-value...which is really not all that matters in wall assemblies. We tend to forget about the mass-enhanced R-value or effective R-value of an assembly. ORNL has done some great studies and work on this in 1998. If you take the lambda value and decrement delay in medium weight wall assemblies (cellulose) in higher R-Values into account it adds tremendous benefits and is very beneficial for both cold and warm climates and can help us to lower our respective loads. My project report on the SunRise home will go into this in detail and provide supporting data from the many wall sensors which illustrate this very well. My conclusion is that with what we have of the shelf materials in our market place at the moment and with the right wall details there is no better way to build a super insulated wall then with dense packed cellulose. Why however do we see so little use of it? The Fiberglass industry holds over 70% market share and spend lots more money on marketing. Right behind comes the new miracle grow - spray foam, which seems the answer to all the questions over the last years. People use what they see and what is in there face all the time...and we are creatures of habit. PS: Dan, great work! You might want to look at Alpha pumps for your solar thermal systems. At one point I was interested in using Spider dense-pack blown-in fiberglass insulation for double walls, as well as for loose attic insulation. A Johns Mansville representative told me that Spider was not approved for loose attic use. I guess it is too loose and fluffy to stay put without some sort of containment, such as a wall or cathedral ceiling provides. I'm referring to the dry non-stabilized variety of Spider. Not sure about the type of Spider that uses a binder to stabilize it. You know what a fan I am of your work, so thanks especially for the kind words. I'll look into but I have to confess I'm lucky to have some very good mechanical contractors in my life and tend to rely on their judgment. And I will certainly underline the pro-cellulose sentiment. I know there are some BIBS and blown in FG contractors around, but I hardly ever see the stuff. We've done many trouble-free cellulose jobs. As I've been pondering the question of cellulose use in New England, I'm inclined to agree with Jesse Thompson: the fact that the Weatherization Assistance Program was born in Maine (with roots in programs established before 1976 by rural community action agencies), and the fact that the WAP has always been strongest in the New England states, means that for more than 30 years, we've had a cohort of experienced installers of cellulose insulation all over the 6-state region. In western Washington State, where I live, I have yet to find an insulation contractor that specializes in cellulose, let alone promotes it really. The general perception is that blown-in fiberglass is more durable and higher performing. And absolutely no one I have talked to is comfortable with damp-spray cellulose, which makes them especially nervous about liability. I would think that New England or the Mid-West would have just as much to worry about in terms of a damp wall not drying rapidly in the colder months of the year. Is there much damp-spray cellulose done in New England? So far, I hear primarily of blown-in/dense-pack. Perhaps GBA type builders typically seek higher R-values than the damp spray can yield anyway since drying limits thickness. Also how prevalent is the "hot-roof" approach with cellulose? I have read people I truly respect weigh in on both sides of that subject. In Washington unvented roofs are common, but I have only ever seen them using foam - typically rigid. On new-construction jobs, it's most common for cellulose to be dense-packed behind netting like InsulWeb. However, plenty of New England builders are comfortable with damp-spray cellulose. No matter what type of insulation you install, it's always possible to screw up the installation. However, if the installers have done their homework, and know what they are doing, cellulose is a great product. "All of this looks of course only at steady state R-value...which is really not all that matters in wall assemblies. We tend to forget about the mass-enhanced R-value or effective R-value of an assembly." I think looking at stated R values of foam assemblies can be very misleading. There is supporting information on the effects of mass-enhanced wood fibre assemblies, but it's vendor based and far less valuable than an independent application test conducted in North America. If you feel like commenting early on the subject in general, and not specifically to your report, I'm sure no one would object. After reading Dan's JLC article and listening to one of Phil's podcasts on building envelopes, I have a question about the placement and type of your air/vapor retarder layers. I remember first noting in a Green Arch Lounge podcast that Phil liked to use taped Zip System sheathing on the outside and then use an air/vapor barrier (retarder?) on the inside as well. He called it a "boots and suspenders approach." Originally I thought he was referring to "air tight drywall" on the inside, but in the JLC article I see the parPac poly membrane is the inside layer. This raises the question of vapor profile for me. The wall I see can not really dry in either direction; Zip on one side, poly on the other. Either, the cellulose is better off entombed as you have it, benefiting from boots + suspenders, or it is in trouble if it it ever gets wet. My friend Albert Rooks, for example, is convinced of the necessity for walls to dry to the outside, others say that they can dry to the inside, alternatively. Your walls remind me of the Bensonwood Homes OBplus panels which I have the same reaction to. How do they dry? Or, do they really not need to? I would love to hear all three (or four) of your thoughts on the approach that you have come to. I'll let the others speak for themselves. Personally, I believe that InsulWeb (which is air-permeable and vapor-permeable) is a better membrane for installing cellulose than par/PAC (which is a vapor barrier). It makes sense to me that walls with taped Zip System sheathing should be able to dry to the interior. Yes, we've stopped using Par-Pac in favor of Insul-Web for precisely that reason. It wasn't our preference to use Par-Pac here; it was what that contractor liked to use. I believe the membrane is perforated by so many staples and fill holes that it isn't doing much beyond holding the insulation in anyway. Albert, this is a very complex topic and not addressed in two sentences. Besides it is pointless without supporting datasets and graphs. You're on my mailer list and will get the report. I am bogged down with too many projects to get much else done right now but try to get the preliminary report out sooner than later. In a nutshell: Dense packed cellulose offers a high decrement ‘factor’ and has a low lambda (thermal conductivity or k-value) value, high specific heat capacity and high density. Foam is a light weight insulation material which has a usually higher steady state R-Value but has a comparable small decrement delay and heat capacity. The time delay in a thick wall on cellulose can be 8-13 hours vs foam 3-5 hours...which becomes very interesting if you think about exterior temperature changes in these time shifts and their difference - and implications on your Delta-T governing your heat loss through the wall. As Dan has said, we wouldn't use Par Pac again. He and I had done much post-construction fretting over this until I managed to corner Joe Lstiburek at a seminar last year. 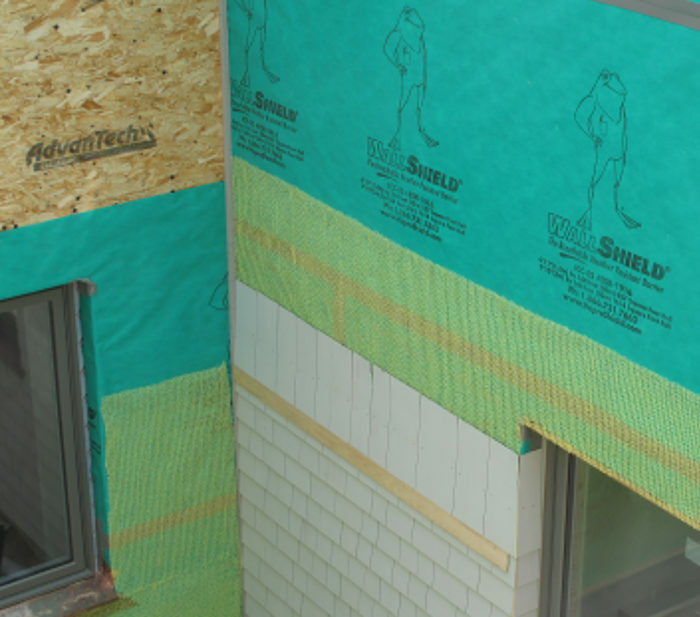 He informed that since we did install a rainscreen, drying to the exterior, despite the presence of taped Zip sheathing, would be significant enough to let us sleep at night. That said, we still primarily rely on drying to the inside and use InsulWeb exclusively now, but rainscreens have also become a no-brainer in almost all cases. I have had talks with Hans Porschitz at Bensonwood about this same issue. Although we've yet to use their new OBPlus wall, it's based on the one we used for a past project with them. Hans is not worried. They have done a fair number of homes with this system or similar without issue. They do seem to rely on OBPlus to dry to the interior. The additional layer of OSB under the drywall is due to the stiffness required for shipping, but on the surface, it does spook me a bit still when I see it. Again, the rainscreen should assist in the composite drying of the structure. Too bad they featured the ParPac in the JLC article. By singling it out they made it seem like a featured element of the design, as opposed to something that you would not actually recommend. Oh well. I also appreciate you thoughts on the OBPlus wall. Two sides of Zip system is an interesting choice. I do not know what the permeability of Zip is. Do you still use the air tight drywall approach on the inside with a taped Zip shell? I would have thought this would add unnecessary cost. Would you argue that it is worth it? I especially like the window details with the woven shingle corners. Can anyone tell me what the sill material is? Were the white cedar shingles treated or stained? I have yet to hear of any problems related to Par Pac - I shy away from it now, but if an installer I liked insisted on using it, I don't know how hard I'd fight it. I've asked around - no one has any direct evidence that it's caused problems, including Bill Hulstrunk of National Fiber, the go-to guy in New England for cellulose. If you've seen an install, you can see how often it's punctured. Plus I think the thickness we install it at (10-14") gives us more leeway - lots of moisture buffering capability. But I might be kidding myself. And Chris - I don't bother with ADA when I use Zip Wall. Unlike Robert Riversong, who likes being able to see and repair the air barrier easily (and it's hard to argue), I like to be able to test my shell before insulation goes in. And Jon, if you're talking about Phil & my project, the sill material is just the metal roofing formed for the sill detail. And the shingles and other exterior trim are all raw. See Martin's third piece on his visit for more discussion of untreated white cedar.